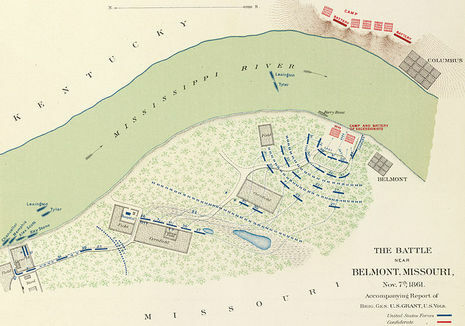 The Battle of Belmont was fought on November 7, 1861, in Mississippi County, Missouri. It was the first combat test in the American Civil War for Brig. Gen. Ulysses S. Grant, the future Union Army general in chief and eventual U.S. president. On November 6, Grant sailed from Cairo, Illinois, to attack the Confederate fortress at Columbus, Kentucky. The next morning, he learned that Confederate troops had crossed the Mississippi River to Belmont, Missouri. He landed his men on the Missouri side and marched to Belmont. Grant's troops overran the Confederate camp and destroyed it. 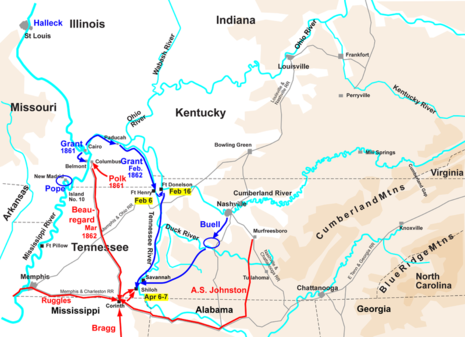 However, the scattered Confederate forces quickly reorganized and were reinforced from Columbus. They then counterattacked, supported by heavy artillery fire from across the river. Grant retreated to his riverboats and took his men to Paducah, Kentucky. The battle was minor, but with little happening elsewhere at the time, it received considerable attention in the press.